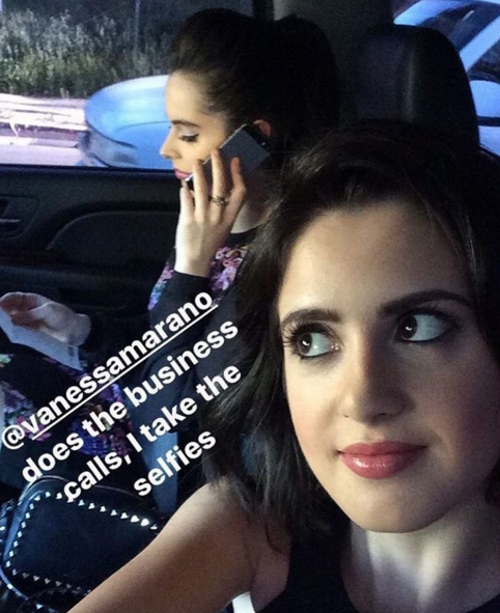 Once upon a time, Laura Marano once revealed that her older sister Vanessa Marano is terrible at taking selfies. At first, we couldn’t believe it, since Vanessa is so stunning in all of her red carpet and photo shoot pics. But then we realized what Laura meant – it’s not that V doesn’t look good in her selfies, it’s that she just can’t set them up properly! In some of their past pics together, Vanessa has accidentally cropped herself out of the frame or looked in the wrong direction in each one! Well now, the fabulous Marano sisters are back with another selfie-snapping adventure, and it reveals even more insight about their photo-taking habits. The stylish duo attended the Ted Baker London Spring/ Summer 17 collection launch dinner in West Hollywood, California together last night, and blessed us with tons of new selfies and chic event photos. But in all their social media photo-sharing, Laura revealed that she’s still the designated selfie-taker in the family – and leaves Vanessa in charge of the business phone calls. “Thank you @ted_baker for a lovely night…all the food was great, but that chocolate cake was divineeee,” Laura shared on Instagram after the event. But how do the girls get such flawless selfies when Laura famously still has a flip phone? As their latest party photos reveal, Laura has her trusty iPad on hand to help out! Honestly, it is really challenging holding an iPad up in the air there like that, so we can see why Laura has taken the reigns on this. All Vanessa has to do is smile that winning smile!